With unemployment still at record lows and roughly 7 million jobs available, finding, hiring, and retaining, the best talent is proving to be a challenge for hiring managers. Job seekers have the upper hand in this market depending on skillsets and industry demand. What does this mean for hiring, at least in the short term? 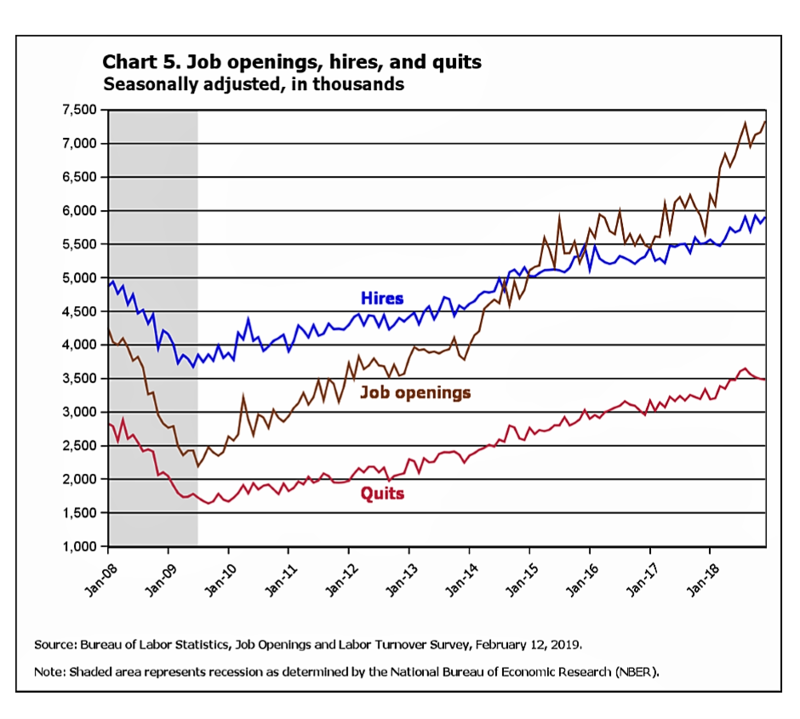 Bureau of Labor Statistics (BLS) data shows a trending increase in quits and hires. In December 2018, 3.5 million people quit their job versus 1.7 million who were laid off. Once hired, surveys find that 53% are not engaged at work (Gallup), 46% of 18-25-year-olds are likely to bail on a job (Ajilon), and 59% of employees will leave if they get a better offer (West Monroe). Takeaway? Count on a more fluid, and in some cases, less committed workforce. Before revolving- door departures become a drain on your productivity, be sure that you understand what your employees want in a healthy workplace culture. Top of the list, according to a LinkedIn survey, is help with work-life balance, a manageable workload, considerate bosses, and career growth opportunity. Interestingly, the salary came next to last on the list. Both Millennial and experienced workers value flex-time, remote work options, career development, and leadership opportunities (2018 Employee Engagement). Offering some or all of these can help tip the scale between loving their job or jumping at a better offer. Get ready to welcome the antithetical workforce as 17 million Gen Zers (born between 1997 and 2012) mingle alongside the 63.4% of working baby boomers. AARP reported that older Americans filled nearly half of the 2.9 million jobs gained in 2018. Active and productive boomers, including some putting off retirement for financial reasons, are staying longer or re-entering the workforce, offering a boon to companies desperate for experienced people. Yes, there can even be competitive advantages to mixing skilled workers with tech-savvy, creative, and energetic Gen Z talent! Bottom line: Consider retention strategies that target older and younger workers. Shorter workdays or enhanced healthcare benefits can often entice valuable boomers to stick around a while longer. Alternatively, a worker on Medicare may value more paid time off, while a younger worker wants medical benefits or education credits. Boost your organization’s technology training by encouraging young experts to share what they know, and create mentorship programs to support growth opportunities, which younger workers crave. Nothing is more inspiring than a team of employees hoisting shingles onto a Habitat for Humanity house in an urban renewal zone! Millennials and Gen Z think so, too, as numerous surveys show both groups prefer to work in companies invested in charitable causes. The business case for CSR policies has been well documented, so choose the activities, whether environmental or charitable, that most benefit your employees, customers, and brand. Key benefits: You can motivate and retain younger workers by giving them work they find meaningful. According to a 2012 study by Pricewaterhouse Coopers, 88 percent of Millennials preferred a company that engaged in CSR, while 86 percent would consider quitting if their company failed to live up to its CSR commitments. Bottom line: a strong CSR policy should be part of your recruitment and retention toolkit. Government employment laws and regulations, wages and overtime tracking, filing mandates, and performance appraisals. The list goes on, but now there are a variety of HRIS solutions to help you get a handle on managing your people: hiring, onboarding, and even gamification – a cool training option attractive to younger workers! The biggest challenge is choosing which program is right for you. How many employees will the system manage? Will I have internal IT support? Once you’ve answered the basics, check out Katz’s list of Top Ten Employee Management Software Solutions. An August 2018 Forbes article estimated there are 57 million U.S. workers in the gig economy. Comprised of individuals contracted for short term or project work, these workers seek flexible employment and control over their choice of jobs. 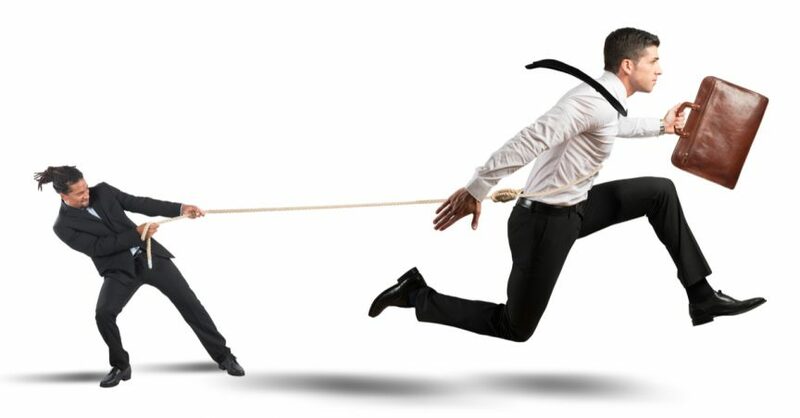 Companies with variable workflows find benefits in the cost and convenience of contractors. However, there is a risk because of how the IRS and some states classify these people. It can be an expensive mistake to mischaracterize the worker as W-2 rather than 1099. Additionally, it takes time to verify the abilities of the freelancerand to check on them periodically to ensure they are fulfilling their promises. Solution: It’s smart to contact a staffing agency like Partnership Employment before hiring gig workers. Partnership Employment’s expert hiring managers have access to some of the most sought-after temporary talent in a variety of industries and job descriptions because many gig workers don’t want the hassle of looking for clients or filing quarterlies. They reduce the paperwork hassle and follow-up by doing it for you. Whether you need full-time or temporary employees or executive search services, Partnership Employment can expand your hiring options in this tight market. Give them a call today!